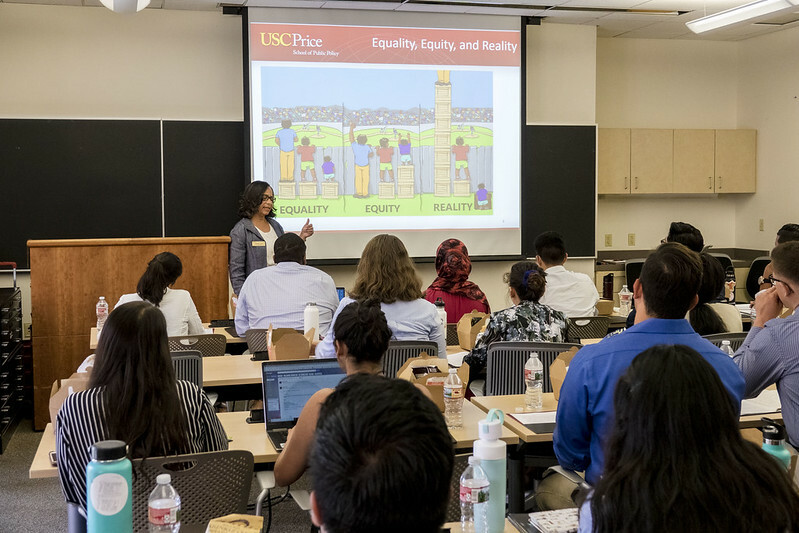 Building upon the momentum from last year’s inaugural USC Public Service Weekend program, the USC Price School of Public Policy introduced 27 undergraduate students from underrepresented backgrounds to the impact that careers in public service can make on social justice and equity. In partnership with the Public Policy & International Affairs Program, the Price School hosted its second USC Public Service Weekend in June around the theme of “Defending Our Communities: The Role of Social Justice in Public Service.” The program was led by USC Price Professor LaVonna Lewis, Sarah Esquivel, the associate director of recruitment and admission at Price, and USC Rossier School graduate student Susana Marquina. Lewis and current USC Price Master of Public Administration students Victor Cruz and Ashleigh Smallwood participated in a panel discussion on the role of social justice in public service. As the first Diversity, Equity and Inclusion Chair for the USC Graduate Policy Administration Community, Smallwood is working to develop student-led conversations and panels on campus addressing issues such as unconscious bias. She spoke of overcoming shyness to find her voice, and the power of developing a mantra. Lewis added that it’s important not to get frustrated over how people respond to your truth, explaining that she has no control over how people receive what she says, but she has total control over what she says. Cruz contended that there is a privilege in attending an institution of higher learning, and the students have the right to exercise that privilege by speaking up against injustices they see. Lewis urged the students to believe that they belong in the room and their voice is important. Recent USC Price alumni, along with other local practitioners, participated in a panel discussion on careers in public service. Afterward, Price Career Services Director Valerie Savior and Associate Director Dominic Alletto advised the students on how they can prepare for such careers. With many of the participants being first-generation college students who have already gone further in education than anyone in their family, pursuing a master’s degree can be a difficult decision that isn’t understood by family members. Esquivel, from Price’s admissions and recruitment office, helped make the process clearer by leading a discussion on applying to graduate school. Participants from last year’s Public Service Weekend formed a Facebook group and remained in contact over the past year. Five local former participants returned to speak in a panel about how the workshop affected them and influenced their efforts over the past year. The weekend culminated with the students making presentations with their interpretations of a case study regarding the mental and emotional effects of “stop and frisk” practices.